Hi guys! I'm currently drooling over the idea of Torrefacto coffee, and, having no experience or equipment to roast my own, thought I'd put the word out to Snob-land. I'm in Adelaide and would be fine to pick up a batch of Torrefacto roasted coffee from you, or pay via paypal for it inc postage if you are interstate... if anyone knows of specialty roasters who do this professionally I'd love to hear from you about them too! As it usually gets mixed in with a basic blend at about 30% I wouldn't want any more than 300-500g to try at the start. I'd also love to hear from any Adelaide roasters who barter or sell their roasts... if you're proud of your technique and want to work with me I barter all kinds of stuff. (Sometimes even wine... why not have one habit pay for another?) Pm me or post here if you want to chat! "Torrefacto refers to a particular process of roasting coffee beans, common in Spain, France, Portugal, Costa Rica and Argentina. The process involves adding a certain amount of sugar during roasting in order to glaze the beans. The glazed beans are then mixed with normal roasted beans. Whilst originally a cheap way of adding weight to the beans, a suggested reason for continued use the technique has been maintenance of the aroma and taste of the coffee. In fact the opposite is probably true and the process sharply increases the acidity and bitter taste of the coffee. The process is not followed in the rest of the coffee world." I would be less than enthusiastic about grinding sugar coated beans in my Mazzer Mini, I can imagine the clean up process after the event. Thanks for the info and research, you have highlighted a common misconception regarding Torrefacto beans... the trouble with these sugar infused beans is at the roaster end, but not as much as you'd think if done with skill and a little experience. The problems come from stopping the batch too early once sugar is added, and getting weights correct when measuring out sugar and beans. In order for the beans to leave sugar in your grinder or cause issues there, you would need the grinder to heat the beans up to sugar melting point while grinding. Anything short of that temp is fine, sugar wise. I'm not sure I agree with the last bit in the wiki info... too many people rave about it once they've tried it, and most of my research indicated that the bitterness level is very low, but not sure of the acidity. Anyway, the very fact that I have never tried it and don't know personally gets me curious, I would love to see for myself! If the grinder does have a clogging issue, well, it won't be the first time I stripped a grinder. 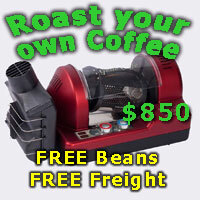 I hope to post an update with personal experience asap after I find a roaster that can do it... I'll let you know. Plus, if wiki is right, all that humble pie I'll be chewing on might taste better with sugar coated coffee! I contemplated the roasting process using sugar, at what stage is it added, too early and the temperatures required to roast coffee would burn the sugar, is it added in granular form or as a syrup, the beans would have to be well cooled before removing from the roaster or they would come out as a sticky mass. It can be done obviously, however I imagine would require quite a bit of experimentation to get the desired result, I'm not sure any commercial Aussie roaster would want to add sugar in any form to a commercial machine, reckon you would need a roaster dedicated to that particular process. Heat isn't the only thing that causes sugar to liquify and make a mess, moisture will obviously do it as well as oil, both are present in roasted beans, I strip and clean my grinder every few months as a matter of course, it's a simple but fiddly job, made a lot easier with the judicious use of compressed air, I suspect it would take a little more than air to remove any stuck on sugar deposits. After reading your post I thought about trial roasting a batch in my Coretto, then I thought about not getting it right the first time, meaning multiple attempts in an effort to master the process, then I contemplated all of that sticky sugar coating my roasting gear and the work involved in cleaning it up at that stage I put the whole idea in the too hard basket. Good luck with your quest, let's know how you get on. Yep the link works fine, interesting read, lot's of warnings, seems the fears I expressed were justified. Yes, seems worthy of worry on a few points. I'm still not sure that there would be drastic differences in grinder cleaning needs, but it'll be worth it to satisfy my curiosity if it is needed... hope I can report back with some success later! Catch you then. Z. Yes a difficult roast by all reports but I agree an interesting one to try and thanks for highlighting a style I haven't heard of. That's what I love about CS, more lets try then no i cant. 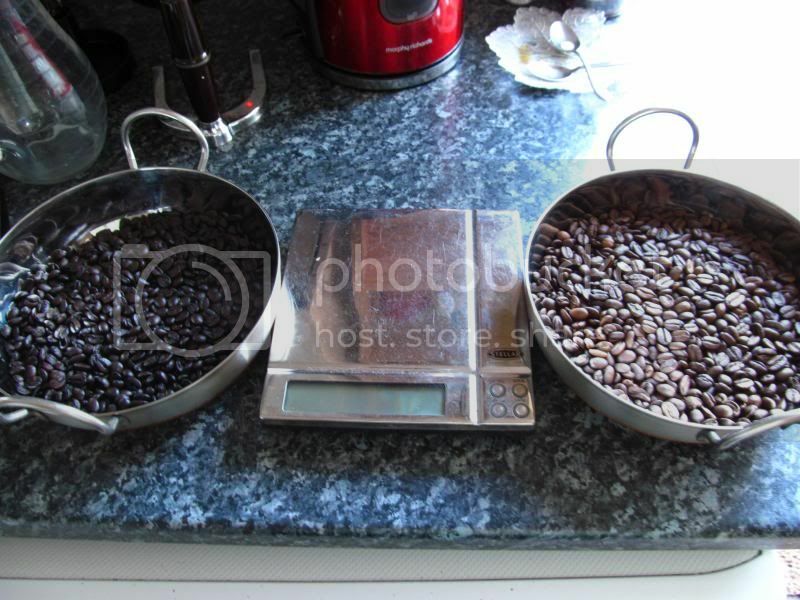 Im the Editor of BritishCoffeeScene and also the writer and maker of the beans you saw in the article. 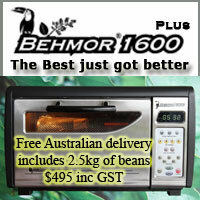 If there is anything I can help with or suggest utilising this method of bean roasting, just ask. Im not an expert in torrefacto making, I just adapted everything I know about the process into this form of hot air roasting and it works for me. It took me a long time to work out all the ratio's for the small scale roast, and if the directions are followed precisely, it will work for you. my parents were trying to tell me that a dash of cognac at the end of my roast would improve the taste of the beans. I never thought the writer of the article under discussion might drop in, that's awesome! I hope you're ok with the link being used, mate... thanks for the great article, too! There must have been a lot of cleaning before you sorted the ratios, I guess. Hopefully now I will be able to find someone in Aus who can sort out a batch for me... unless, Garyw, how would you feel about being an internationally recognized coffee roaster (by posting a batch to South Australia)? I'd be happy to spring for postage if you are in Philippines or USA... UK or Spain might be a bit costly, though. Yes, I really am that curious! Doing it this way will still cost me less than setting up my own roaster and going through all the learning needed just to roast well... then I'd have to re learn with the sugar added... DOH! Brain hurting just thinking about it! Im currently in the U.K.
Roast until just into 2nd crack. either add another straight batch in the breadmaker and roast...or just scrape what is left on the pan sides and clean. There will NOT be much sugar at these ratio's in the pan. Now.. I would suggest you roast some robusta. Why? simply because you can add it to anything at between 10% to 35% ratio, and have a really balanced espresso or latte with the berry of your choice. You can try several different single origins this way. It is worth doing it yourself simply because the taste is amazing in a milk base, and you will want more. Next time I roast torrefacto I will video it for you. Sounds great, and thanks so much for your time thus far, too. I look forward to learning as soon as I can scrounge the time! You say do it by volume but then you give directions to do it by mass. So should it be done by volume or by mass??? Well professor. At sea level d=m/v. In the USA, the word "ounce" represents both a unit of weight, 1/4 of a pound, and a unit of volume, 1/4 of a pint. This from the fact that a pint of water at sea level and room temperature weights a pound. I was in the USA for many years and adopted a lot of their known parlance. We can do it the hard way or assume its easier for the small amounts of similar substances to be measured in mass and be close enough. I stand corrected in my hastily written note to Zennan. Please let us all know how your Torrefacto roast turns out. Morning Gary, not sure where you got your information "In the USA, the word "ounce" represents both a unit of weight, 1/4 of a pound, and a unit of volume, 1/4 of a pint." As a unit of weight 1 ounce = just over 28 grams, there are 16 ounces in a pound. As a unit of volume 1 ounce = 1/16 US pint, 16 fluid ounces = 1 US pint. An American pint is 16 fluid ounces, 1 pound or 454 grammes. An imperial pint is 20 fluid ounces, 1 pound, 4 ounces or 568 grammes in weight. There is not much distinction between fluids/volume and mass in the division of ounces in the States. An ounce of whiskey is either by volume or weight and its roughly the same. Both are divisible in 16 oz. I used the example of saying a 1/4 of a pint or a 1/4 of a pound. I guess it wasnt clear due to leaving out: "For example..."
Im just finishing clinic after 14 hours and am doing 3 things at once. Apologies. In the end, the clarification for the weight for those that want to try torrefacto has been made. Last edited by garyw; 15th March 2013 at 12:03 PM. Reason: clarification. There is not much distinction between fluids/volume and mass in the division of ounces in the States. And there-in lies the false assumption that causes so much confusion and problems in the cooking world in the US. One Fluid Ounce (Volume) equals one Ounce (weight) is only precisely true for water at a specific temperature and elevation. This is roughly enough true for some liquids that you can use the two units interchangeably. Such as for alcohol, milk, and fruit juices. It is very wide of the mark for things like molasses and honey. It is also highly inaccurate for use when dealing with solids. For example the mass of flour for a given volume can vary by 50% depending on if it's tapped down or well sifted. In the specific case of water vs granulated sugar even tapping the sugar down so as to pack as much as possible into a given volume the same volume of water still weighs 15% more. 15% more or less sugar is not a trifling amount and can dramatically change the outcome of a recipe. So, now that the measuring part of the equation is fully sorted... anyone want to roast me some sugary beans? I'll need a fair bit of time to learn how to roast from scratch, and patience was never my strong suit! Plus, thanks to all for the contributions so far! It'll all help to make it work once one of us does try and get this cooking. I checked into prices for sending to Australia. Not worth it. The problem with Torrefacto is that it needs to be done on or in a vessel separate from the main roaster that you use. We have a Toper commercial in the Roastery, and it will NEVER see sugar in it. Get a large metal dog bowl. add 300 grams of robusta. It will dry beautifully. Spread them out. this is a variation on using the Corretto, and is a little messier, ie you might end up tossing the spoon rather than cleaning it..However, it will get you into to torrefacto cheaply without a steep learning curve. As for the bowl... heat up and wipe out.. add washing liquid and scrub with boiling water.. It will come good. I did it this way for 2 months until I was sure that I could transfer to the breadmaker without too much mess... in fact it was easier (apart from a bright idea once or twice to double the sugar and see ... I saw) in the breadmaker and there is no mess now at all to speak of. Im up too 700 gms at a time now, and make it for friends and for myself. 700 gms can make me nervous as the rotator blade sometimes struggles if the heat vs stickiness is incorrect in the bowl... outside temperature (its cold in the UK and you dont want to do this inside) plays a part in everything working together. Left is Torrefacto. Its a lot shinier than looks in the pic. I will do a video of torrefacto making in the next couple of weeks. I'll be trying it asap! Thanks so much for all your time and effort with this, Garyw... I'll let you guys know how it goes once I gather my courage and get it rolling. Any Aus based correto users can still let me know if they want $40+ for a 300g bag plus postage! It'll take me a few weeks to get my first batch rolling, I reckon. Feed the adrenaline, hear the roar. Gotta love that sound! I love my new Corretto - photos from my first roast..
Gotta love a Sunday roast.